But we've also got a championship still up for grabs, and so it's fascinating to see what Lewis Hamilton and Nico Rosberg are sharing this week. And let's not forget there's a rankings title up for grabs too, with just two weeks left and a tie at the top of the table! +4 Felipe Massa: Lovely interview between Rob and Felipe Baby. +1 Felipe Massa: Spot of football for one Felipe Massa. +2 Daniel Ricciardo: This really is a pretty epic photobomb! +2 Nico Rosberg: Full on training montage for Nico here, including underwater punching, why not? 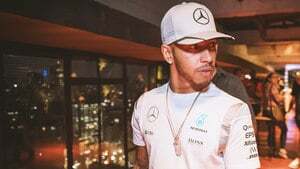 +3 Lewis Hamilton: Incredible interview with Lewis answering questions he may not have heard before - no Snapchatting required here! +2 Jenson Button: Good exit interview by JB here, although I'm not sure he should admit to being open to bribes like that! +1 Romain Grosjean: Trying to pass off excitement for the new Cars 3 trailer as if it is on behalf of his kids but we all know the truth. +2 Marcus Ericsson: Bless him, live tweeting a couple of posts whilst supporting his brother in a kart race. Heartbreak in the final though!